Apologies for the lack of posts lately. I've been busy with fieldwork in the Pioneer Valley so had little time for blogging. That much said there's been plenty going on in Gill and surroundings and the normally 'quiet' mid-June period has yielded a number of incidental surprises, not least of which was a dark (Plegadis) ibis heading north over West Gill Road on Sunday morning (06/14). No pics unfortunately, not even any bins as I was riding my bike at the time but it was almost certainly a Glossy Ibis. On the other hand, White-faced Ibis is occurring with increasing frequency in Massachusetts and has even been found breeding in the state and I don't think can be ruled out on a fly-by. Another surprise this week has been the number of Orchard Orioles on territory in Gill. This is my fourth spring in the area and the month of June normally yields one or two singing males, especially along River Road but over this last weekend I had singing males on North Cross Road, Main Road (3) and at Gill Elementary School and I haven't even checked River Road where this male (below) was singing in late May. 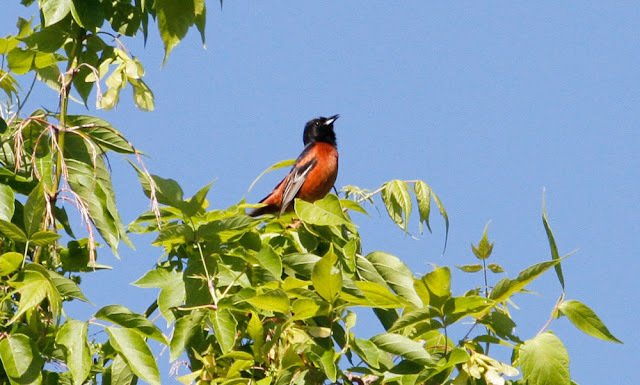 Orchard Oriole - singing male, River Road, Gill, Franklin Co., MA. late May 2015. On Sunday afternoon we had a family bike ride in Turner's Falls and heard and saw a Fish Crow calling at last year's breeding site just south-east of the 11th Street bridge. This is now the third year in a row that I've had them here in summer and it appears to be a traditional breeding spot. Later the same afternoon, I photographed this family group of calling birds on the powerline cut above Greenfield's Stop n' Shop supermarket. 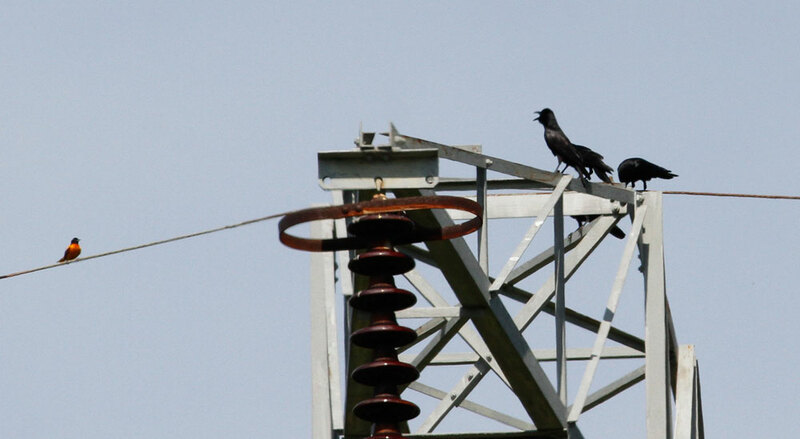 And then, returning to Turner's Falls, had another family group of Fish Crows flyover the 11th Street bridge. I love hearing their nasal calls and they certainly seemed to be established as summer breeders in the Turner's Falls/Greenfield area. Fish Crows - vocalizing birds, Stop n' Shop, Greenfield, Franklin Co., MA. June 14th, 2015. Three of four present around the supermarket parking lot on a hot Sunday afternoon. Since I was in Turner's Falls, I spent a bit of time looking at the local Turkey Vultures hoping for a return of last months Black Vultures. No such luck with the Black Vultures but it was nice to see a Peregrine sparring with the vultures for a few seconds before it moved over the town. 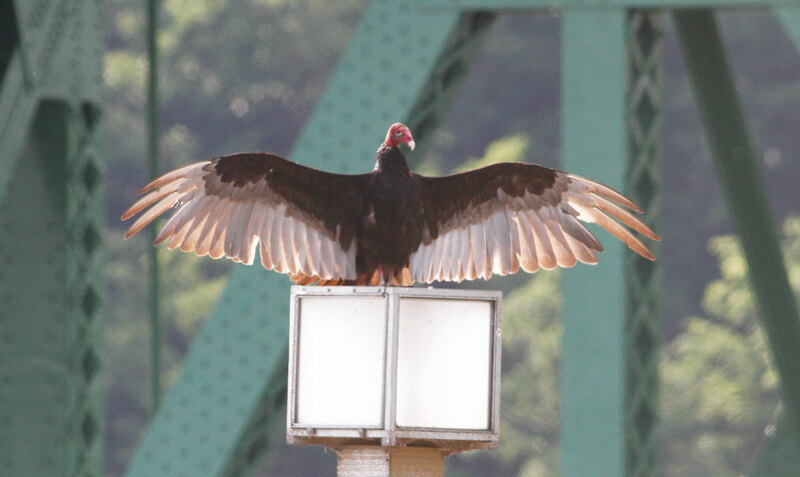 Turkey Vulture - Turner's Falls, Franklin Co., MA. June 14th, 2015. One of about 15 roosting around the Turner's Falls bridge. No sign of any Black Vultures today.